The movement was led by Nelson Nurse, who hailed from South Africa. It was marked by enthusiasm and youthful, evangelical fervor. Unfortunately, there was also something else. 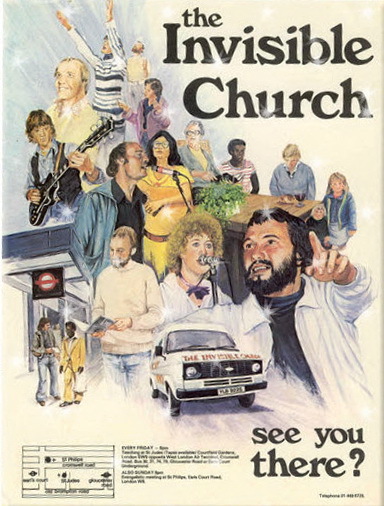 For a short time in the late 1970’s I attended a gathering known as “The Invisible Church” that met in Earl’s Court, London. At first sight it seemed a standard evangelical “free” church, and I enjoyed the worship times I managed to get to, but that little warning bells began to ring as the longer-term members started to talk about their pastor, Nelson. In conversation it was “Nelson says this”, and “Nelson says that we should…” Rarely were the phrases “The Gospel says …” or “Jesus told us that …” used. It became clear that Nelson was the final arbiter of what was said and thought for the members of this church, and so I left. This was also the experience of the founder and co-publisher of Apologetics Index, who briefly was involved with an Invisible Church group in Amsterdam. Many of the people in that group sounded like they had been indoctrinated to all give the same answers to common questions. The words of Nelson Nurse were indeed highly revered. His Nelson Letters — typewritten, photocopied and hand-illustrated pamphlets with brief remarks and answers to question received — conveyed news about the movement. The Amsterdam group met in a house at the edge of the Red Light District. At the time, some people of the two Youth With A Mission bases, along with staff members of The Shelter Christian Youth Hostel, visited or attended The Invisible Church. The leaders of this particular group displayed cult-like behavior, ranging from odd requests (demanding that people sang only songs that originated in The Invisible Church), to unreasonable demands on people’s time. Missing meetings — or spending ‘free’ time away from the group — was strongly discouraged. The publisher of Apologetics Index was severely chided for missing a meeting due to having to present a radio program. Though interested in studying cultic groups, he elected to immediately leave the group. While Nelson’s letters were cheap photocopies, The Invisible Church — which its leaders and dedicated followers (in Amsterdam at least) seemed convinced was the church to belong to — was marketed with slick brochures. Included were brief endorsements from several prominent Christians such as Corrie ten Boom, Brother Andrew and gospel singer Andrae Crouch. As it turned out (and as so often is the case) these endorsements were merely based on brief visits to the church in South Africa or meetings with one of the leaders — and were given without proper investigation into the movement. The movement eventually petered out. Nelson Nurse moved to Perth, Australia, in 1985, and worked there as an artist. He passed away in June 2011.